The TC Electronic RUSH BOOSTER is a clean boost pedal designed to give guitar players up to 20 dB of gain. This gain is transparent, thanks to the discrete analog circuitry employed in the pedal. Use the RUSH BOOSTER for some extra volume on solos, lead parts, or wherever else you need a little more level. Controls are exceedingly easy; you get one Volume knob and one bypass/engage footswitch. With these two controls, you can achieve a significant boost in level without changing the tone—unless, of course, you're using the RUSH BOOSTER to drive your tube amp harder. The RUSH BOOSTER can be powered with a 9V battery or a 9V adapter like the Powerplug 9, both of which are available separately. 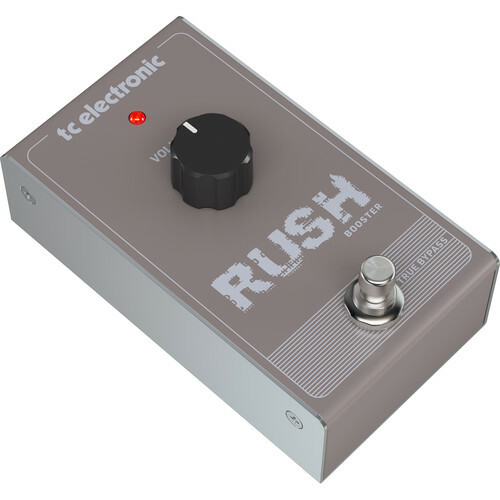 The pedal utilizes a true bypass footswitch, so your signal remains pristine and unaffected when it's disengaged. The RUSH BOOSTER also has a rugged metal frame, so it can stand up to the rigors of the road.